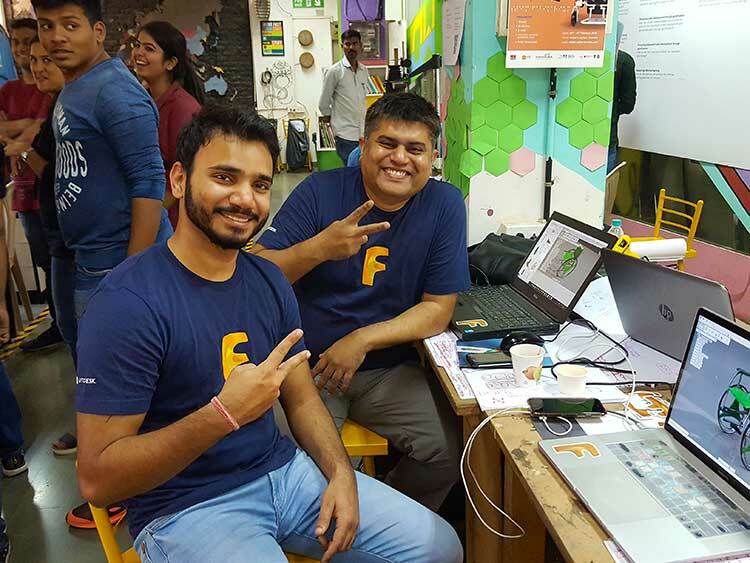 From February 10-14, the Maker’s Asylum in Mumbai got together a hundred or so people for a Franco-Indian hackathon. Objective: find DIY and low-cost solutions to make disabled people’s lives easier. Portraits. Mahen Pitale (left) and Vinod Rawat (in the center) with one of their maker-biker buddies. Hit by a truck when he was 6, Vinod Rawat lost his left leg. 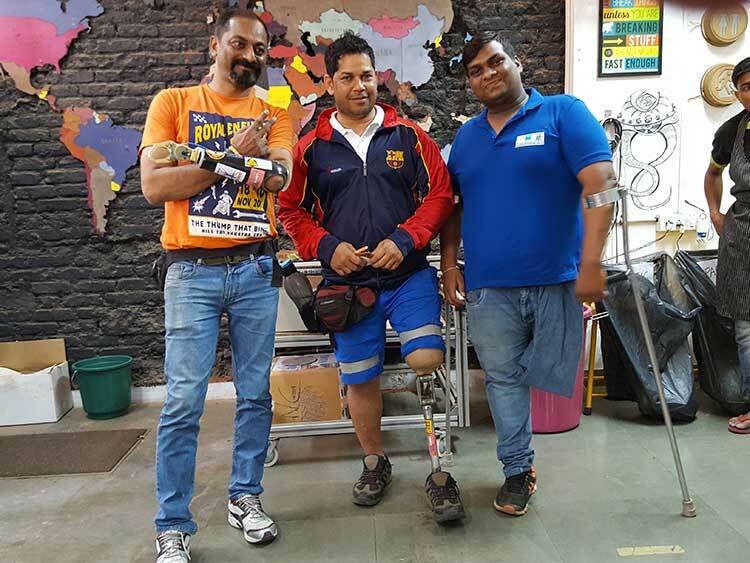 Equipped with a Jaipur Foot prosthesis since the age of 27, this sportsman is training for the Mumbai marathon, climbs the Maharashtra summits on a bicycle… And most importantly, rides a motorbike. “I first joined a MC (Moto Club, editor’s note) but they rejected disabled people. With friends in the same situation as I, we decided to create our own club. We even went to Ladakh to help people after the earthquake!” Since its creation in 2010, his MC, the Convoy Control Club, welcomes more than 120 members, opened six chapters and takes part in numerous biker meetings such as the Rider Mania in Goa. Survivor of the Mumbai train bombings in 2006, Mahen Pitale, lost his left forearm there. Thanks to the bionic hand prototype inspired by Nicolas Huchet’s Bionicohand this other maker-biker from the club hopes to find heat and pressure sensations in order to help him maneuver his bike… or phone more easily when driving. “We should all be more open to others,” affirms Ankita Patil. 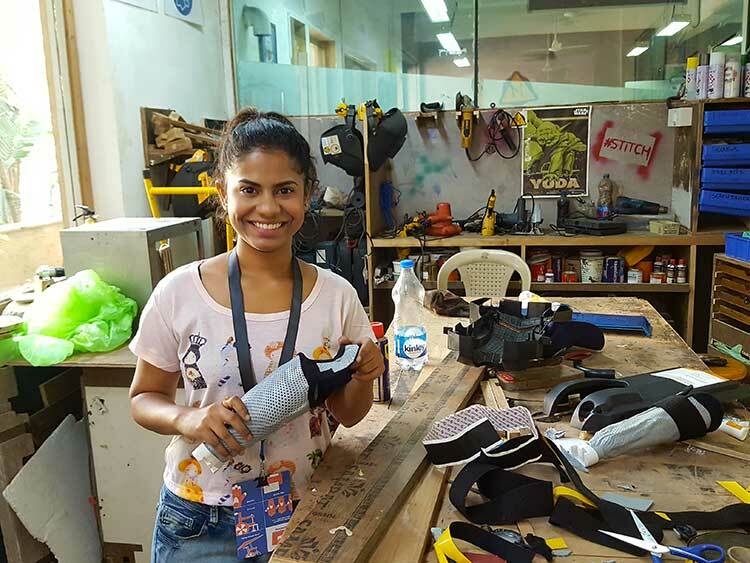 3rd year student in mechanical engineering at Mumbai university, Ankita Patil worked with Nicolas Huchet’s team and his bionic hand project Bionico to develop a new socket prototype during the STEAM Fabrikarium. An alternative to prohibitively expensive prosthetic solutions offered on the market. Equipped with sensors and a battery, the prototype is already operational. “We model the socket in thermoplastic. The complete fabrication process takes us an hour,” explains Ankita Patil who is focusing on the man-machine interface of the prosthesis. “In the end, we will be able to add anything we like,” as demonstrated Nicolas Huchet with his “mosquito swatter” hand during the final presentation of the projects. Neha Saigal, analyst of the program PMKVY. 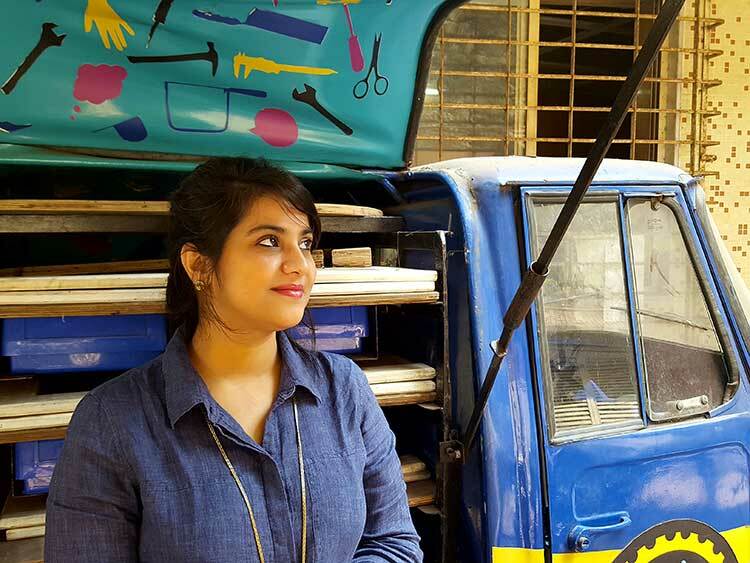 Neha Saigal came to STEAM Fabrikarium as an “active observer”. She knows a great deal about disability issues in India. Now an analyst at the Pradhan Mantri Kaushal Vikas Yojna, a program from the National Skill Development Cooperation (NSDC) in Delhi, this former regional coordinator of Handicap International came to see how solutions imagined during the hackathon could be implemented, for example, in rural areas. “First, one would need to carry out a preliminary study to identify the true needs of rural India: must one head for the Bionicohand or go towards a version made from low-cost materials one could find even more easily in the countryside?”, she asks herself. Varun Heta and Sanjeev Ghosh, engineers at Autodesk. Faisal Thakur in his bicycle store. Mentor of the Fabrikarium for the Flying Wheelchair team—a wheelchair adapted for paragliding—Faisal Thakur is an expert cyclist. And an authentic activist for the cyclist cause in a megacity asphyxiated by vehicle traffic, totally out of control. 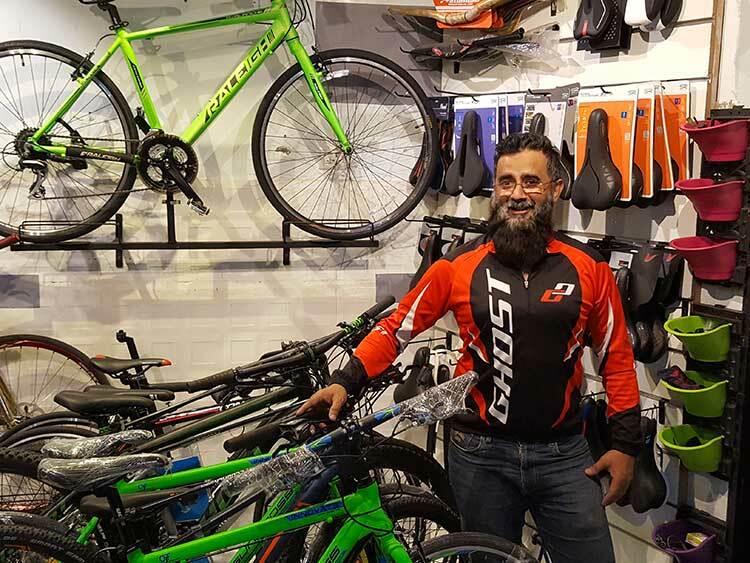 This former BMX champion, passionate about customization, opened a store in Mumbai in the West Bandra district close to the coastline where he is developing is own brand of bicycles. He even equipped the Mumbai police with mountain bikes and works with the teams from the Indian Institute of Technology to refine his prototypes. Abhijeet and Priya Thube, brother and sister from the Maker’s Asylum. At Maker’s Asylum, we also work as a family. During the whole duration of the STEAM Fabrikarium, Abhijeet Thube and his sister Priya were very caring for the participants. He is a sound engineer and DJ in his spare time. Member of staff, he is in charge of logistics and operations. His mission? Ensure that the hackathon teams do not lack anything, from the material to connections including the organization of meals. As for Priya, she manages the events of the place. Artist and blogger, fan of fooding, she earned her first stripes in advertising. So, not too complicated to work as a family? “No problem, because my brother knows that I am the boss!”, she burst out laughing. 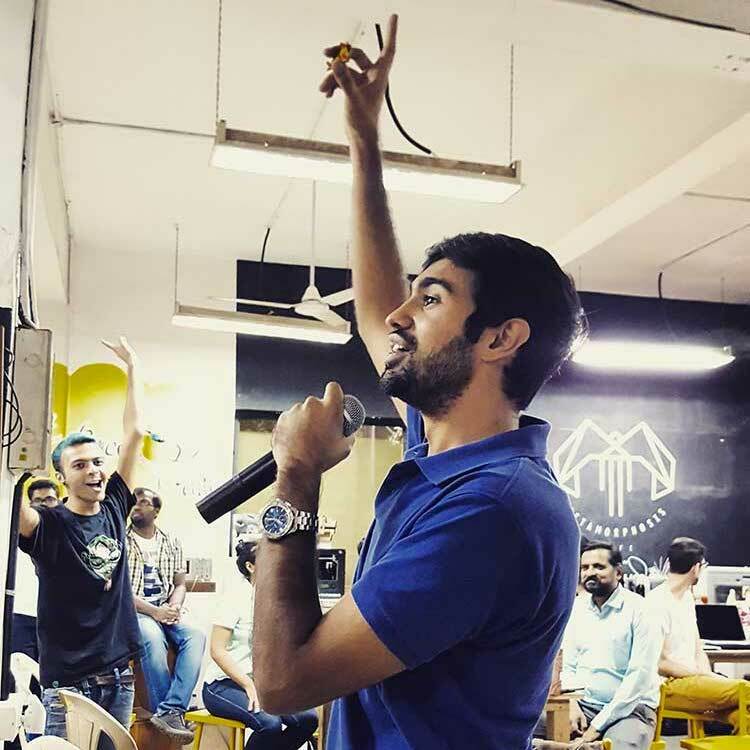 Vaibhav Chhabra, founder of Maker’s Asylum. Difficult to talk about STEAM Fabrikarium without talking about Vaibhav Chhabra, great organizer of the event and founder of Maker’s Asylum. Graduated from Boston university, this engineer in mechanics earned his first stripes at Eyenetra, a MIT Media Lab start-up that develops low-cost ophthalmological diagnosis tools on smartphone. 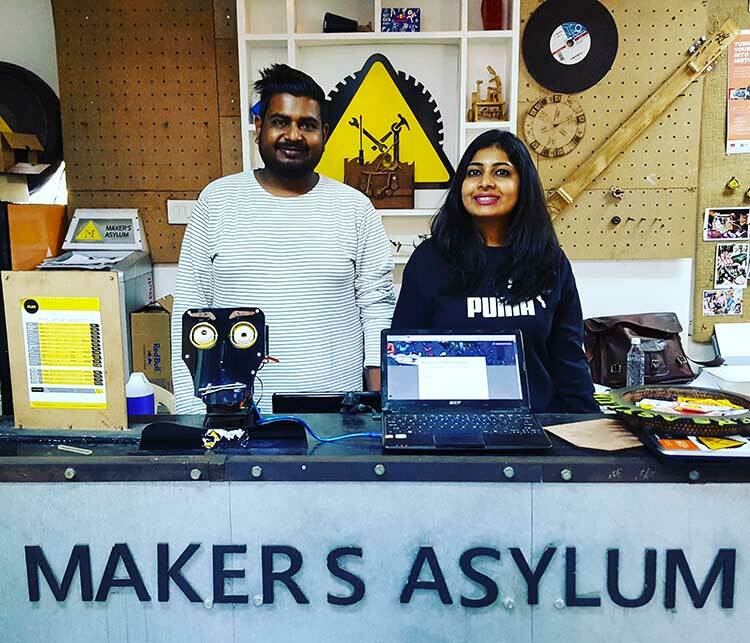 But it was in 2015 that he devoted himself definitively to making with the creation of Maker’s Asylum that had in time become the largest makerspace in Mumbai. Since then, Vaibhav Chhabra’s agenda has been overloaded: signatures from partners left and right, inauguration of a second Maker’s Asylum in Delhi, his native city, launch of the STEAM School then the Fabrikarium… “It’s simply incredible to see what we managed to do in just three years!”, he exclaims in front of a cheering public.